Global supply chain leaders from around the world will convene in London next month for the Leaders Forum, hosted by SCM World, a Gartner community. At this exclusive event, the world’s most influential business and operations executives will share their insights and experiences in a closed-door setting like no other. This year's Leaders Forum will focus on The Power of the Profession, identifying strategies to grow through digital transformation, lead with purpose, and inspire teams. 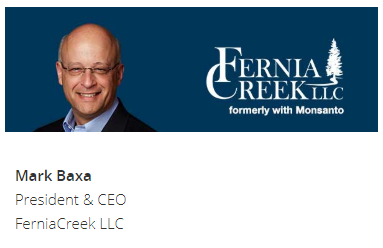 One of the supply chain leaders addresses this theme is Mark Baxa, President & CEO of Fernia Creek, and former Head of Global Procurement at Monsanto, who will present "World-Class Supply Chain Collaboration, Redefined." This thought leadership session casts acknowledgement on the very idea that supply chain collaboration delivers results. But the concept of synergistic collaboration— the confluence of leadership, talent, and technology – can actually achieve something no man has done before. "World-Class Supply Chain Collaboration Redefined" will take you on a leadership journey that increases your ability to lead with a compelling vision that inspires greatness, not only engaging your own people but connecting your suppliers to the vision, as well. Mark is the Founder, President & CEO of FerniaCreek LLC, a global supply chain consulting group based in Jefferson City, Missouri. In his last role at Monsanto Company, Mark led global teams accountable for leading and delivering excellence in global supplier relationship management (SRM), sustainability and supplier diversity, championed the global supply procurement & supply chain collegiate talent pipeline and procurement communications strategy. Mark led and developed the company’s formal global trade organization, standardized global processes and suppliers, and created and led the global trade operations & compliance IT digitization optimization project. Mark is also the CSCMP Chairman of the Board-Elect (Council of Supply Chain Management Professionals), a 7000+ member supply chain organization and is co-lead & instructor for St. Louis University’s Global Supply Chain & Trade Compliance Certificate Program within the Center of Excellence. Mark has over 35 years of leadership experience having worked previously for the Monsanto, Upjohn and ELM companies. Amber Road is honored to return as a Gold Sponsor at this year's Leaders Forum. We hope to see some of you in London!